I seem to have an invasion of parasites of the hair and scalp. Actually, this invasion involves only the scalp. The initial infestation involved pustules attached to base of hair follicles (no longer present). There is intense itching at the site of the burrow, especially late night into dawn. Scratching produces tiny black specks - (one per site) which leave crusted fissures and tenderness. I have not been able to find specific information about this problem. I have never had head lice, and this does not resemble chiggers which I have suffered before. My best guess at this point is scabies, but it is atypical of scabies infection in adults. Have you considered and/or ruled out folliculitis? That's what it sounds like initially. I agree that what you are describing doesn't really resemble a typical scabies infection, and chiggers don't often attack the scalp, and certainly not exclusively. My guess is that you may have folliculitis or similar type fungal infection on the scalp. What have you tried to relieve it and help eliminate the problem from your system? I would rinse the scalp thoroughly with a mixture of sea salt and warm water every day. After rinsing, apply a mixture of lavender and clove oil or lavender and tea tree oil. dilute the mixture so as not to burn the scalp and make the application much easier. I prefer organic cold pressed coconut oil, but you can use olive oil or another carrier oil if desired. Leave it on the scalp as long as you can before washing it out. Obviously it is oily, so perhaps applying the mixture before bed would be best and then washing it out in the morning. If you have trouble cutting through the oil, try a little Dawn dish soap (or something similar that has a degreasing agent in it). That's just topical treatment. For severe cases you will probably need to attack the infection internally as well. It's easier than you might think. ...will help clean out an overgrowth of fungus in the system and restore the balance of good bacteria. It will also boost your immune system and help it get back in balance. These are excellent natural supplements that I use myself and have seen great success both in my own family and with many other clients. You really have nothing to lose as they have a 100% money back guarantee behind them when you order them from AIM. Hoping this helps you as well as those who come to this page later with a similar condition or concern. Your daughter's head should certainly have healed by now. What has she been applying to the wounded area? It sounds like she may have an infection or possible infestation. Has a doctor looked at it? How is the rest of her health overall? Any other issues or health concerns? Consider applying some organic cold pressed coconut oil to the area a couple of times per day to see if you can promote proper healing. That's what I would try myself and if there are parasite concerns I would definitely use the Herbal Fiberblend as well to try to eliminate them. My daughter got hit in the head last summer and left a gash it never really healed closed up but has a serious dry skin patch that flakes really bad,she say something is crawling inside it and it hurts bad when it moves what could it be? It sounds like thread worms, hook worms. 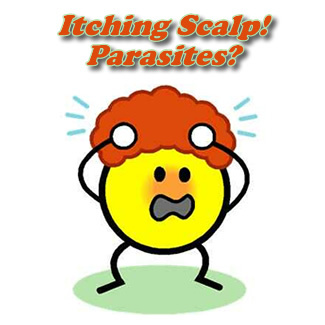 Sorry to hear about what you've been going through, along with the others that have also been suffering from what seem to be parasites of the hair and scalp. Your situation sounds a bit different, though. First of all, it's very strange that they are treating ringworm with an anti-parasitic medication. Granted, ringworm can technically be classified as parasitic because it is a fungal condition, but it's not a "worm" type of parasite, which is usually the concern when these meds are given. That's not to say you don't have other parasite concerns, particularly since you have been testing as positive for parasites. Many people WITH parasite issues don't test positive, so you're lucky to actually get a definitive result. Anyway, if it doesn't burn too much, try mixing up some clove oil (just a few drops) in some organic coconut oil (or olive oil if you can't get your hands on the coconut oil) and apply it topically to the affected areas that seem to be ringworm. Both of those ingredients are anti-fungal and anti-parasitic, which may help clear up your infection if you use it faithfully for a few weeks at least a couple of times per day. I would also HIGHLY suggest that you help your immune system internally by cleaning out the inside and building up the good bacteria in your system. You really have to get your body back in balance in order for it to be able to heal. It's always heartbreaking to see people who are suffering for so long without receiving good advice that can make a real positive change in their condition. There's no "miracle cure" but you definitely can't expect your body to have a chance to heal if it doesn't get the help it needs to eliminate the bad and build up the good. It's really simple and yet not widely encouraged. I hope you'll be one of the ones who "gets it" and gets results. I have been struggling with the same condition now for over eight months, the condition that I have myself diagnosed as Morgellon's. I have been to the emergency room several times, once told I was delusional and asked what medicines I was on, the next visit to the ER I was diagnosed with Ringworm, given anti parasite medication. The third dermatologist also said ringworm, I tested positive for a parasite infection. After taking another antiparasitic medicine for another thirty days I was brought into a small side office at dermatoloigsts office and fired, the secretary, not the doctor told me there was nothing else they could do for me, she told me they were going to refer me to a psychologist until my hair strand test came up positive for a parasite infection. They handed me an outdated list of infectious doctors in area, but made no referral. Then with lesions all over my head saw infectious disease doctor he did no tests but said if the last dermatologist said it was ringworm, then it must be ringworm, he prescribed the antiparasitic medicine, told me to come back in about two to three months. The condition has gotten progressively worse, not better. I now have bites all on the back of my neck, looks like maybe flea bites and two very inflamed ringlike circle on neck with what have what looks like hair in it. My point is that I understand, wish I could give you some better news. You are not alone though. I am going back to the same infectious disease doctor tomorrow and again plead for help. I could not see another doctor because I needed a doctor referral. Stay strong, you are not alone. Oh yes I sponge Borax detergent with antibacterial dish liquid at night for the itching, it does help. I have had intense itching after a 'Brazialian blowout treatment', I scratched so much that I had open sores that became infected. I had bumps all over my head and I believe that I had follicolitus. The doctor told me it would go away and said my scalp was dry. but it wasn't dry. The pustules would break and would make my hair oily. I was on an antibiotic for acne and I broke out in hives. I itch intensely every night. It looked like it might be better at one point. There were no more pustules. Then my scalp became sandy and I developed pimples. When I combed my hair , the pimple would break and the condition worsened . Now , I have noticed that I have tiny specks that come off when I come my hair. They are iridescent. I went to the emergency room last week because the itch turned into a burn that was so intense. I have mold in my apt. and every time I go in the bathroom, and touch and part of me, it turns red and is extremely itchy and burning. I asked the doctor if I had mites and he said he say no indication of mites. He gave me steroids and said my immune system was poor and it might be topical dermatitis. I disagree. I think I have a fungus caused by mold. But what are these sparkle spots. I didn;t tell anyone because I didn't want anyone to think I was crazy. I did tell my ex husband today. Who cares what he thinks, He thought it could be a fungus. I have an appointment in 2 months with the dermatologist. What do I do in the meantime. My girlfriend noticed that I had a sparkle on my face. I have bought all kinds of vitamins and have been eating vegetables and fruit juice. My hair gets extremely oily and I just washed it this morning. The sparkles are still there. I fell like they are made of metal and are sharp. I have a lint roller in bed with me, because the stick to it. Help me. I just want to know what is going on . It has been 7 months of craziness. Anyone who has crawling and itching with black specks may have Morgellons. Please look it up and read about it. If you are having bowel problems and seeing white things in your stool, you definitely should try an internal cleanse. I wouldn't be surprised if you once you've cleaned out the inside that the outside takes care of itself! I always use Herbal Fiberblend and it works great for cleansing. did you find out what it is yet? i have the same exact symptoms.